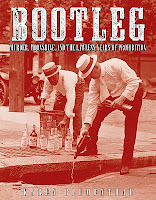 Bootleg: Murder, Moonshine, and the Lawless Years of Prohibition by Karen Blumenthal. Grades 6 and up. Flash Point (Macmillan), May 2011. 160 pages. Review copy provided by my local library. This book starts with gangsters. On January 17, 1920, the Eighteenth Amendment went into effect, outlawing the sale, transportation, and manufacture of intoxicating beverages. The amendment was supposed to make the country stronger and more moral. It was supposed to protect the children and strengthen families. Instead, the country began a slide into lawlessness, inviting corruption and gangs to take over. Karen Blumenthal examines Prohibition from its roots in the early 1900s to its repeal in 1933, and even though we know from the get-go that Prohibition "failed", Blumenthal shows us a balanced view. Women's campaign efforts contributed greatly to the ratification of Prohibition, perhaps paving the way for the Nineteenth Amendment, giving women the right to vote. Prohibition also resulted in fewer arrests for drunkenness and an overall reduction in the amount of alcohol consumed for years to come (even after the amendment was repealed). The book's arranged very effectively and it starts with a bang (kind of literally). The opening paragraphs describe the St. Valentine's Day murders, an act of blatant violence spearheaded by public enemy Al Capone. It was certainly enough to grab my interest and it's sure to grab the interest of many teens, as well. Quotes and photos pepper the pages, helping to bring the time period to life. Extensive back matter includes a glossary of Prohibition terms (including words like "bootlegger", "flapper", and "teetotaler"), source notes, an author's note, and a thorough bibliography. This book is a valuable resource for reports, with writing accessible enough to be recreational reading for young historians. Check out another review at The Fourth Musketeer. And then go check out this book because Bootleg is on shelves now! It's Nonfiction Monday! Head on over to Simply Science for this week's roundup!